Diamond fluorescence is easily one of the most misunderstood and over-rated characteristics of a diamond. x-rays. This luminescence is typically a soft blue hue. Under normal lighting conditions, except in rare instances, this effect is not discernable to the eye. 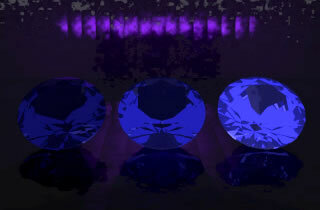 To see a diamond fluoresce, it must be viewed under black (ultra violet) lighting as shown in the image to the right. Faint blue, medium blue, and strong blue fluorescence. The amount of fluorescence in a diamond is rated as none (sometimes shown as negligible), faint, slight, medium, strong, very strong, and intense (sometimes shown as distinct). At Novori Jewelry, we do not sell diamonds with a fluorescence rating stronger than strong blue because it has a higher chance of affecting the value of the diamond. In some instances, but not always, a strong blue, or very strong blue fluorescence can cause the diamond to appear milky or cloudy. For this reason, a diamond with any level of fluorescence typically retails for less than a diamond rated as having no fluorescence. Is this fear of fluorescence justified? Not really. If a medium to strong fluorescence reduces the price then that just works to the purchaser's benefit. At Novori, we will examine your diamond for you on the off chance that the fluorescence is affecting the diamonds appearance. "For the average observer, meant to represent the jewelry buying public, no systematic effects of fluorescence were detected. Even the experienced observers did not consistently agree on the effects of fluorescence from one stone to the next. In general, the results revealed that strongly blue fluorescent diamonds were perceived to have a better color appearance when viewed table-up, with no discernible trend table-down. Most observers saw no relationship between fluorescence and transparency." In the 1920's, diamonds with a blue fluorescence and a color rating of colorless were referred to as "blue-white" and were highly sought after. Unfortunately, sales people used the term too loosely for any diamond with fluorescence and the term "blue-white" was outlawed by US trade practices laws. While fluorescence will normally have no impact on a diamond's clarity, there are those who claim it can potentially have some minor value towards a diamond's color. The idea is that the slight yellowish tinge is cancelled out to some degree by the slight bluish hue of the fluorescence. This idea is not strongly supported by the GIA flourescence findings in their study on fluorescence. What Makes a Diamond Fluoresce? When a diamond is in its natural state, its electrons are stable. If when a diamond is exposed to UV radiation the electrons become excited they move in and out of a high energy state. When the electron relaxes from its high energy state back to its natural low energy state, it releases the excess energy. This released energy is measured in its wavelength. A emitted wavelength of 420 to 450 nanometers will appear as a bluish hue. 97% of diamonds that fluoresce display a blue fluorescence. The remaining 3% of fluorescent diamonds display colors of violet, green, yellow, orange, and red. Buying a colorless or near colorless diamond that has a fluorescence other than blue is not normally recommended. 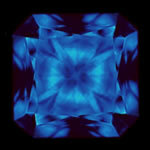 We do not sell diamonds that have a fluorescence that is not in the blue range. The bottom line is that diamond fluorescence will not have a noticeable effect on your stone unless you are someplace where there is strong UV lighting (maybe a nightclub?). There is a noticeable difference in price however, so buying a diamond with a medium to strong fluorescence can be an attractive deal. If you have any questions about a diamond on our web site with fluorescence, we would be happy to speak with you about it and have a gemologist inspect the stone for you.